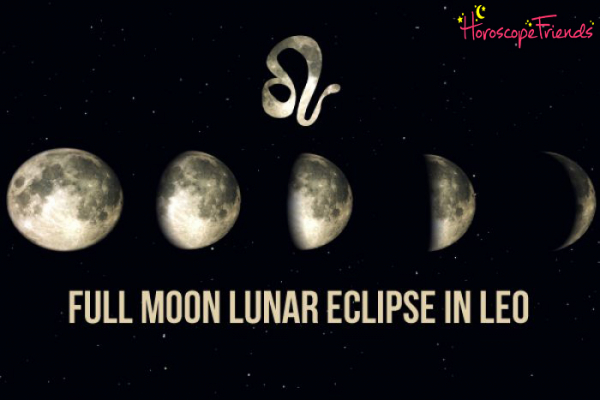 We’ve got the second of 2019’s eclipses, a Full Moon Total Lunar Eclipse in Leo (at 0:52 degrees) on the night of 20th-21st January 2019 and things are literally on a knife-edge! This powerful eclipse means ‘curtains’ on a play that’s been going since February 2017. It’s sounding the bell for a big, dramatic finale so that you can be ready for the next life-chapter. You’re ready to graduate, to do the honours, to step into your power and move on. So, think back: what’s been going on in your life for the past couple of years? It’s all coming to a big red hot conclusion! This is a Blood Moon Supermoon in Leo. Not only is the Moon totally eclipsed by the earth, turning red, but it’s also very close to us, appearing big, hot…talk about making a dramatic exit! All this is sure to bring passions to the boil so try to take it easy over the next few days. This Leo Supermoon Total Eclipse acts as a portal, opening the door to tons of love, creativity and vitality to flow into your life! It’s also a moment to release pent up energy. This is your cue to step into your heart and embrace your truth and authenticity. Dare to stand out! Be brave! This is a North Node Lunar Eclipse, calling you to your destiny. You’re done playing around. It’s time to get serious! This Blood Supermoon presses the fast-forward button and…your stomach gives a lurch as you’re whisked to the future! The future is here, sooner and faster than you’d ever imagined possible! With Uranus square the Sun, Moon and Lunar Nodes, expect surprises, twists and turns… This is your final wake-up call (the alarm’s been ringing for years, ever since Uranus entered Aries in 2010) and it must be answered. The rehearsal is over. The cosmos is hell-bent on seeing you move forward in full regalia, like the star that you truly are! This eclipse is fully visible in North-South America and only partially visible in parts of Europe, Africa and the Near East. How does January’s Leo Blood Supermoon affect your Star Sign? Has love had its day, dear Aries? Is it time to wave goodbye to a love affair, a hobby or a particularly childlike way in which you used to view the world? Perhaps one of your children is experiencing a major life transition calling you to stop being a child yourself and become a grown up? Love between grown ups is grand so don’t be sad. Ditto, if you’re entering big business - it’s more fun playing with the big boys! This total eclipse of the heart opens a portal into what makes you tick. Your heart’s capacity for joy is enhanced ten-fold! You’re done making do with the leftovers. You’re ready for the real thing! True love! You’ve been on a rollercoaster journey of self-discovery for the best part of a decade now and it’s time to let your heart catch up with your new self. It’s “The End” as the story goes, dear Taurus. Yes, this is the absolute ending of the matter, the end of a situation at home or with your family. The end of inherited patterns and unconscious childhood programming running your life. You’re ready to uncover your true, authentic self in a distinctly private, personal yet no less glamorous and breathtaking moment just for YOU. This isn’t about you shouting out from the rooftops; or stepping onto the world stage. No. It’s an innermost moment of total empowerment and awakening to who you really are inside. A portal of love, joy and creativity opens in your soul releasing tons of energy. It’s a kind of spiritual awakening, the catalyst being secrets revealed, mysteries solved and an intuition so perfectly polished, you can practically see your future in it! Your mind positively sparkles with joy, dear Gemini. It’s like the scales have been lifted from your eyes and you finally see the light! This is a whole different set of truths and facts than the way you’ve been perceiving the world before. Expect dramatic changes with siblings and people in your immediate environment. A portal of love and joy opens up close to home, calling you to speak your truth, yell it from the rooftops and communicate straight from the heart! Workshops, books, tv / radio-shows, speeches and all kinds of learning and communications are your magic doorway to finding your authentic voice. A brilliant social community of friends and likeminded exciting people are the catalyst for this light-bulb coming on in your head. Are you ready to enter a whole new earning bracket, dear Cancer? This eclipse signifies a total and dramatic shift in the way you earn your living, a shift that’s been bubbling for the past couple of years now. Are you ready to re-evaluate the way you value yourself and what you have to offer to this world? Are you ready to embrace wealth? As one door closes, a true portal of abundance opens up in your life. It’s crucial that you dare to be yourself and honour your true, authentic gifts, as you step out into the world. Don’t be afraid to be different! A change in status or career is your catalyst to a whole other earning level. A brighter financial future starts here! This is your big moment, dear Leo! You’re the star of this show and the moment has come to take the stage and take a dramatic bow, waving goodbye to the character you’ve played for such a long long time. It’s time to step into brand new shoes and embrace a more empowered, joyful, authentic YOU! You’re ready to reinvent yourself and see yourself in a totally different light. An international connection, a publication, broadcast, accreditation or other unhoped-for event could be the trigger for this amazing shift, lifting the veil from your eyes and showing you that anything is possible! All limitations to your freedom to be, have, do what your heart desires are only perceptions in your own mind. And you’re ready to shift these. You’re finally healing this loud and clear. The sky is the limit! This is a time of dramatic endings in your social communities and groups, dear Libra. This superlunar eclipse is wiping the slate clean with certain friendships and associations, raising your awareness and, where needed, making room for new and more inspiring people to enter your life. You’re about to find your true peers, your authentic community! But first, others have a few surprises in store, acting as a catalyst for you to review your ideals and your place in the world. The culmination of a dream or ambition brings huge rewards, also signalling the end of that project. It’s gone as far as it’s going to go and it’s time to dream new and bigger dreams for the future. Expect some incredibly dramatic career shifts, dear Scorpio! Literally, one professional chapter closes in your life and another one begins. After nearly a decade of discomfort around your work, a big final wake up call sounds loudly, calling for you to step up, bring more of your creative power into the world and shine your authenticity for all eyes to see! What’s more, this moment is here much sooner than expected. Someone high and mighty could be eclipsed in your world at this time, creating a vacuum for you to step right in. You’re ready to step up to the plate, take charge of your destiny and make your mark! The world is changing before your very eyes, dear Sagittarius, and that calls for a dramatic, total change of your worldview. Expect big changes if you work in broadcasting and the media, sales or marketing, academia, travel, the law or anything that crosses borders and boundaries touching people’s hearts and minds. A portal to absolute freedom opens up for you. Are you ready to spread your most authentic message yet? Where is your heart at? A lover or creative hobby could be the catalyst for all this, or it could be a child. Your heart flutters and you’re finally ready to step into your own truth without fear! This blood moon super-moon strikes at the very core of you, dear Capricorn! It strikes at your joint finances, your close relationships and your sexual energy and vitality. A wake up call is sounded for the very last time to get your affairs in order! Your attention is being called to financial agreements, debts and taxes, as well as your closest, most intimate relationships for one last time. It’s time to get serious! Are you willing to change? Are you willing to be fully authentic in all your dealings with lovers, business partners, banks and sponsors and meet others honestly, straight from the heart? Your own willingness to change acts as a catalyst as you embark on an empowering transformation. You’ve got something big cooking on the relationship and PR front, dear Aquarius! Is it a dramatic relationship ending? Or maybe you’re ready to stop messing around so you can embark on an all-powerful and very real partnership with someone, a true meeting of hearts? Either way, it’s time for lesser relating patterns to die and for you to step onto a much bigger stage. You’re discovering a whole new way of connecting with people and peeling an old relationship layer to uncover true brilliance! You’ve now a whole new set of expectations from your significant other. Exciting new ideas, people, contracts and travel are the key to this very public, dramatic transformation. Expect dramatic endings at work, dear Pisces! It’s time to step into a more authentic role at the office and to jazz up your work and daily routine. This supermoon eclipse opens a portal for more life and vitality to flow into your body for healing, as well as for greater creativity to flow into your work-place. Do you have the lifestyle you want? Do you love what you do? Do you live from the heart each and every day? Do you love and honour your body? If you answered no to any of these, it’s time you did something about it. You have some unique gifts to offer! Financial surprises, a change in your resources or your need for greater financial independence could act as a catalyst for change.